We love this calendar. It helps our daughter learn the days. We get to talk about our day and what the upcoming days are. As well, we talk about our feelings as it has the emotions tiles. We get to understand what she's feeling and why. The only issue we have is that there isn't a lot of Canadian holidays or event magnets but we will make our own! My 3 year old loves this calendar. He needs help with it because there are a lot of pieces, but he wouldnt learn if I wasnâ€™t helping him. My son is 3 and yes, there are too many pieces for his age. I removed and stored several of the magnets (e.g., the seasonal ones) so he's not tempted. Otherwise, great tool to introduce concept of days, seasons, weather and even mood! Love thid product, it will make a super fun/learning tool for our 5yo grandaughter! So many parts. I often ignore the age recommendations and I probably should have paid attention this time. It's a little too advance for my two year old but this will definitely be perfect for when she is older. It's bright, colourful, and easy to use. Love this. My daughter who's 3 loves learning her days of the week and numbers. Just wish it also had more Canadian holidays. I love this calendar, we got it for my sons 5th birthday and he loves it , he is always asking about the date and what were doing today etc so it was perfect . he loves changing it every morning to reflect the day and seeing the words is helping him remember how to spell them. All the pieces in view on the bottom panel can be somewhat distracting so we fold it up and behind the main board which really helps . 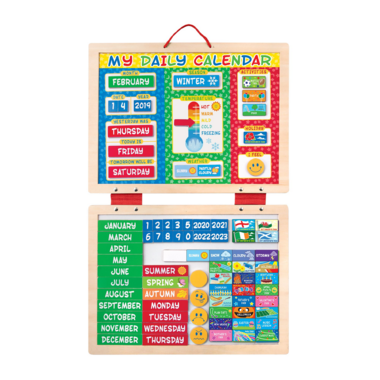 so happy to add this to our homeschool room...the kids enjoy filling out their daily calendar!! Good quality product but my 3-year old was overwhelmed by all the pieces. I think it will be a good learning tool when she turns 4 though. Seems like a good product, but too advanced for my 3 yr old son. Maybe in a few months or when is 4.